Before MSNBC's apology, pro-Palestinian activists praised the segment as a rare instance of mainstream media honesty about Israeli occupation. 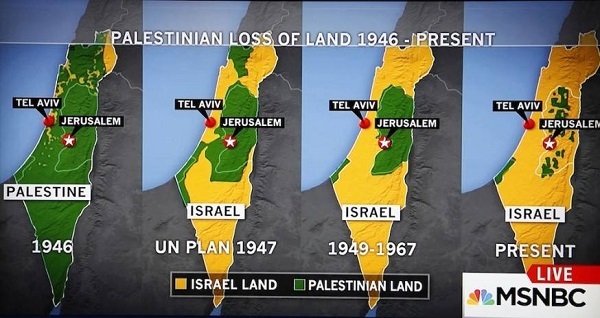 New York, NY — MSNBC aired a well-known, but controversial graphic that illustrates how Israel has taken over Palestine as the occupation of the region has grown over time. The graphic, which appeared during an Oct. 15 discussion between MSNBC anchor Kate Snow and Martin Fletcher, a Middle East correspondent, shows a series of four maps dating from 1946 to the present that depict the loss of Palestinian territory to Israel. “It claimed that in 1946, present-day Israel was under Palestinian rule, leaving out the fact that it was under British Mandatory rule until May 14, 1948, when the British Mandate came to an end. On Oct. 19, MSNBC aired an apology in which Snow called the maps “not factually accurate.” Fletcher also appeared and acknowledged that although there was no internationally recognized country called “Palestine” in 1947, twice as many Arabs as Jews lived in the region at that time.